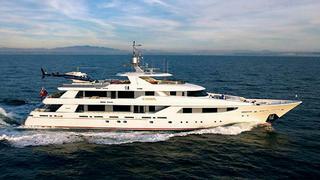 The 50 metre motor yacht Evviva has had a $2.45 million price cut at Ocean Trawler Yachts. Built in GRP by US yard Westport to a design by William Garden, she was delivered in 2006 as one of the yard's Westport 164' range and is ABS classed. MCA compliant, an interior by Donald Starkey accommodates 12 guests in six cabins including a full beam master suite, two doubles and three twins. All have entertainment systems and full en suite facilities. The main saloon is warm and elegant with two large sofas to port and starboard and the requisite 50 inch wide screen plasma television that rises out of the forward cabinet. Further forward a formal dining table in sapele wood with mahogany accents seats twelve guests. The lounge on the upper deck of this tri-deck vessel offers a more informal atmosphere, with wonderful views to port, starboard and aft. The lounge amenities include a vista bar to port, a games table, a desk and chair, a 61 inch LCD flat screen television and comfortable television viewing area. There is easy access to the bridge deck aft for al fresco dining under the stars. Twin 3,650hp MTU engines give her a range of 5,200 nautical miles at 12 knots. Lying in Seattle, Evviva is down from $24,950,000 to $22,500,000.